I picked up several new board games this weekend at a sale in Niles, including Carcasonne, “a clever, tile-laying game.” Carcasonne is a well-known classic among those who play the newer set of German-style board games, but probably little-known outside of that. 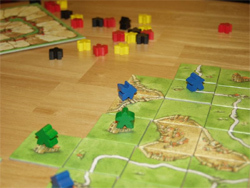 Carcasonne has 72 tiles with various combinations of connecting roads, fields, cities, and abbeys. Each player has 7 follower tokens to deploy as the game progresses and the board is built by each player in turn picking a face down tile and laying it so that it fits with the adjacent tiles. It's kind of like building a jigsaw puzzle that's different every time. When you lay a tile, you may also choose to place one of your followers on the road, in a city, in the field, or in the abbey depending on what features that tile has. As cities are enclosed and roads completed, you score points and regain your follower tokens to deploy and hopefully score again. Leave too many followers stranded on hard to complete cities and roads, and you'll fall behind quickly. Or just put all your followers in a spoon. As it is with all German-style games I have played, the strategy revolves around when and where to deploy the limited resources you have to best advantage, and luck plays a role in how or where those resources can be played. Replayability, tight game mechanics, and a determined game end combine for a very fun genre of games that deserve more attention than the poorly designed “how much pop culture can you recall?” filler that stocks too many shelves. Stace and I played yesterday during a Charlie nap. Carcasonne is simple to learn, great for 2 players (but can go up to 5), very fun, and we can finish in 30-45 minutes — perfect for Charlie's nap length. One of the few games we have that can be played by only two players. I like to play with the river extension. I played that game or something very similar to it. Pretty fun, but not something I'd play over an over again. It came with the river expansion. We're going to try that next time. I also picked up Balloon Cup, which is supposedly a reasonably good 2 player game. Anneke, I'll let you know on that one, once we try it out.